The battle for water is only going to worsen with growing populations, intensification of farming, and complicating factors such as climate change. The good news is global warming will result in increased rainfall due to higher evaporation rates from our oceans and seas. The bad news, this is predicted to fall mostly in what are already wet areas, while dry zones such as Africa, California and Australia are only going to get worse. There are thousands of battles to be fought over water – some of them already happening, and some of them we are only just starting to realize. Stupid or corrupt authorities grant rights to corporations to bottle our water and sell it back to us. I believe our governments have an absolute obligation to provide safe drinking water to homes. Instead, many have abdicated this responsibility, providing cities with rancid chlorinated tap water, thereby encouraging us all into consuming bottled water. Companies like Nestle’ and Coke get unbridled access to pristine bore or aquifer water, while nearby cities get tainted runoff. 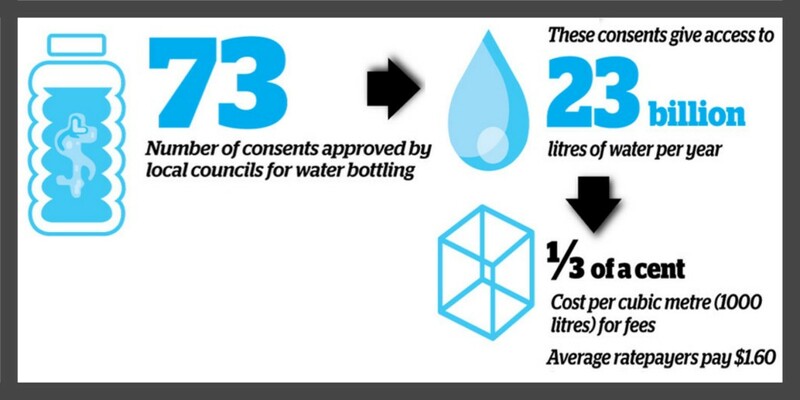 In New Zealand we have the farcical situation where consumers pay 500 times as much for their drinking water, compared with bottling companies. Don’t even get me started about the foolishness of bottling water and transporting it all over the planet. I was pondering this last night. New Zealand, like the US and elsewhere, is really struggling with water. If New Zealand is struggling with its high rainfall and low population, what is going to happen in the rest of the world? But the problems we face here are symptomatic of the much larger water battle. As farming here has intensified, so too has degradation of our waters. But it is a slow process. Farmers are applying more nitrate and phosphate fertilizers, which of course leaches into waterways, making them “richer” for want of a better word. This leads to increased algal and weed growth, gradually choking the waterways. Take my word this is happening all over the world, but the change from one year to the next is not so great, and the public barely realize it is happening. Farmers take more water from aquifers, rivers, and streams, reducing flow and habitat for animals. The value of an eel, carp or trout is low, compared with revenues / taxes from peaches, tomatoes and apples. If eels and trout had a voice, we would long ago have addressed farmers unlimited access to water for irrigation. We might also have addressed our water consumption in cities. Our governments want growing populations to fund healthcare, welfare, military and the elderly. Our cities keep growing to house these growing populations, and the water sustaining it all must come from somewhere. Gardens, baths, washing cars, hosing down the kids – it all takes water from a source that was historically supporting wildlife. Today many of these waterways no longer even make it to the sea. The mighty Colorado River comes to mind; It’s path into Mexico is now just a dry riverbed. Every last gallon is sucked up for farming just before the Mexican border. The Murray River in Australia is a similar case. Now it barely makes it to sea except when there are floods. There are so many more aspects to this. Runoff from construction sites and developments. Deforestation. Soft meandering waterways being replaced with hard edged concrete drains. Chemicals and pollution from factories and the public. Feedlots next to waterways. Invasive species. Plastics. The most fundamental element sustaining life as we know it, has been taken for granted for too long. It is time we started to consider our stewardship of water, rather than just its ownership.